It is always better to put the post title before the homepage title from SEO point of view and google. Nowadays when you use a third party template, then they are not optimized for this type of display in search results. They show blog title first and then your post title. That results in less clicks on your posts. 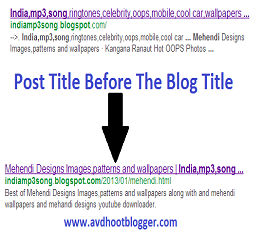 So to revert it, I have written a detailed step by step procedure through which you can optimize your template for showing the post title first and then your blog title. I do not agree with the myth that Google does not provide importance to meta tags. It does not matter if it gives priority or not but you must use meta tags. Because many other search engines like yahoo and bing still gives priority to meta tags. So you must optimize your template for other search engines too. Now take a close look at many popular blogger blogs and websites they are also using meta tags. So why not you. Below is the step by step procedure how to add meta tags to your blogger template and optimize it for SEO. To add meta tags to your blogger blog. Follow step by step instructions. Noe place the below code after it and edit. Now you have to edit this and then you have successfully added the meta tags to your blogger blog. Type your blogger blog keywords, Your name and your country name. These are the meta tags that I have also added to my template and I am pretty happy with the results. This is the simplest way for how to add meta tags to blogger blog and edit the template. Have you submitted your blog sitemap to google webmaster tools. If not then do it now because by submitting a sitemap you invite google bots to index your site and include your pages in search results. So it is the very important part of your SEO efforts. But the most important part is do something advance so that in future you do not have to manually submit your sitemap. So for this we have a great idea. Go to crawl then sitemap. Hit on add a sitemap button. Now as you can see a blank box after the url. You have to copy this code and paste it in your blank space and you are done. This is it and you have submitted your website sitemap to google and soon in 1 or 2 day it will index all of your posts. Now till the 500th post you do not have to manually submit the sitemap code. It is also a very important way to optimize your template from SEO point of view. Yeah Alexa rank is worldwide accepted parameter to check site popularity among the others. So you cannot run away from it and you must optimize your template for this also. Let me clear a few things about Alexa. Higher Alexa rank does not mean that website has a high volume of search engine traffic. Few of my entertainment website have more than 15,000 pageviews in a day but there Alexa rank is 2,14,000 so this rank has no relation with your traffic. But yes it somewhere depends on the number of backlinks and Alexa toolbar installed on the other desktops. So do not worry about up and down on Alexa rank but focus on traffic because traffic will make your blog popular not the Alexa rank. But as we are discussing here for complete optimization of your template from SEO point of view so let's accept it and claim your website on Alexa. When you claim your website Alexa will give you the code that you have to paste in your template below the head tag and you are done. You must also use the Alexa widget of ranks and encourage your visitors to write an Alexa review for your website. This also will help you to increase Alexa rank of your website. I tried it in the first and still using and I think it really works. Did you notice when you created a blog on blogger platform then blogger itself asks for the title and description of your blog. It is a very important part of SEO optimisation of your blogger blog. You must be very careful in choosing titles and description of your blog. Choose a short title and try to add your main keywords in title but keep it short. In description, you must add your keywords but remember to add those keywords also which you added in the title. There should be a resemblance in title and description. It will be much better if your website domain also based on one of your main keywords. Take an example of avdhootblogger. My main interest is a blogger. And i mostly write on blogger widget and blogging tips. Now see I have added all these in my title and description of my blog. Blogger is included in my domain "Avdhootblogger". My keywords like widgets for blogger and blogger tips are in my title. My keywords like blogger widget, blogger tips are also in my description. So overall point is a blogger is the main keyword that is inserted into domain, title and description of my blog. You must also do the same way and optimize your blogger template for SEO. So this was all the points like the post title before the homepage title, adding meta tags, sitemap submission, Alexa code and keywords in title, domain and description to optimize blogger template for SEO. So this were all the suggestions from our template doctor to optimize your blogger template for SEO. If you like this article then please comment and tell me what are the other suggestions we can make. Description : With few codes you will know how to optimize your blogger template for SEO by our template doctor guide.